Avocado, as well as citrus trees, produce an abundance of bloom. But only a fraction of those flowers remain to produce fruit. Furthermore, after the fruit is set, some premature fruit drop will occur; it is the natural thinning process. Yet any stress occurring during the time of bloom and young fruit development, will cause additional fruit drop. These stresses include too much water, not enough water, nutrient deficiencies, vog (volcano emissions), and a few days of sudden high temperatures. Heavy rains during the bloom period can also contribute to low or no fruit set. Since pollination is principally by bees, a lack of them will also add to poor fruit set. In addition, avocado trees are categorized according to their flower type, either “A” type or “B” type flowers. When only trees of the same flower type are planted together, they will produce fruit. However, when the opposite flower type is planted nearby, production is increased. Having both flower types in a commercial orchard is important. In a neighborhood setting, a high probability exists that a tree with an opposite flower type will be in the area. Also note that avocados will produce a heavy set of fruit one year and usually rest the next by producing a lighter set. If trees are a grafted variety, they should begin to produce in three to four years, while avocado seedlings (non-grafted) will take much longer to produce, perhaps seven to ten years. 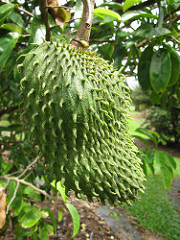 Soursop, related to the cherimoya, is a mid-sized tree reaching about 25 feet tall. It is best propagated from seed which will germinate in 15-30 days. The fruit, which can weigh up to 10 or 15 lbs, is often used in making sherbets and other drinks. The tree grows rapidly and begins to bear in 3 to 5 years. Unfortunately, a normal crop for young trees is only 12 to 24 fruit per tree. When producing fruit, this tree is particular about its environment. It has been observed in tropical countries that soursop trees grown in very humid areas often grow well but bear only a few fruit, usually of poor quality. Most of their flowers and young fruit fall because of a fungus called anthracnose, which does exists in Hawai`i. In Puerto Rico, the tree is said to prefer an altitude between 800 and 1,000 ft with moderate humidity. Drought stress is another reason for fruit drop. Mulching is recommended to avoid drying of the shallow, fibrous root system during hot, dry weather. Dry conditions, rainy conditions and high humidity all contribute to poor production. In some areas of the world hand pollination is recommended. There may not be ample insects around to pollinate, and therefore, fruit production would be low. 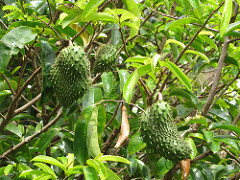 Now for some humorous folklore: in Materia Medica of British Guiana, the cure for intoxication is “break soursop leaves in water, squeeze a couple of limes therein, get a drunken man and rub his head well with the leaves and water and give him a little of the water to drink and he gets as sober as a judge in no time." Strange bugs are observed feeding on the stems of pepper and other plants. Some are dark, and the others are green. These bugs are actually different stages of the same critter, the solanaceous treehopper. Because the back of the adults comes to a point much like the keel of a boat, they are also called the keeled treehopper. The spiny, dark looking bugs are the immature stage; they are fairly easy to control with a soap spray. The adults are green and are much harder to control. These treehoppers are common on peppers and poha berries or gooseberries (same family- Solanaceae). Tomatoes can also be attacked. They don’t seem to do a lot of damage, but of course, they are draining the plants of some nutrients. Vigorously growing plants are seldom attacked in their prime, but are vulnerable towards the end of the season. Biological control of these insects is poor except for some egg predators. The best and safest control measure seems to be a strong spray of water from the garden hose. This will wash them off the plant. The immature will not return; some of the adults may work their way back to the plant. Check out http://nathistoc.bio.usc.edu/hemipt/keeledtreehopper.htm for some strange looking pictures of the solanaceous tree hopper (Antianthe expansa).